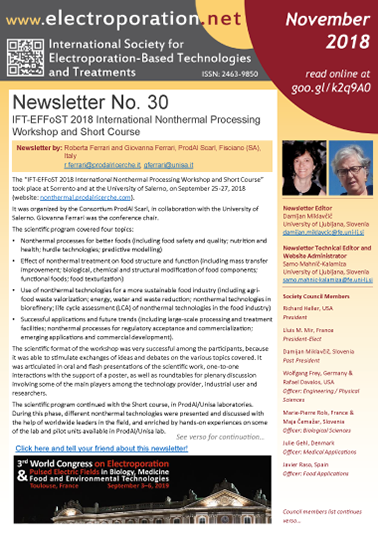 The 30th issue of the ISEBTT Newsletter brings a report from the IFT-EFFoST 2018 International Nonthermal Processing Workshop and Short Course, and was written by Roberta Ferrari and Giovanna Ferrari of ProdAl S.c.a.r.l. Also, as Richard Heller wrote in his e-mail sent out with the October 2018 issue of the newsletter: an important part of the mission of the ISEBTT is supporting Schools and Workshops that are within the scope of electroporation. 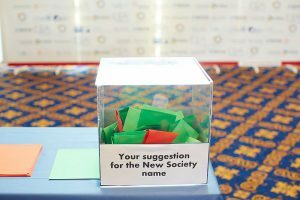 On Friday the 26th of October, the Council of the Society agreed to set aside US $10,000 to support schools and workshops in 2019. The organizer (must be a member of ISEBTT in good standing) can submit a request at any time as long as that is at least 2 months before the start of the event. For more details see http://www.electroporation.net/about/support-of-schools-and-workshops. Stay tuned also for the upcoming news on the 3rd World Congress on Electroporation (https://wc2019.electroporation.net) to be held in Tolouse, France from September 3-6, 2019.